Satyabrata Dam looked at the rear cargo section of my Honda CRV incredulously. "I must take a picture of this," he said. "All this stuff for a weekend hike!" He could barely conceal the shock that was written all over his face. Our dog Baby gave him a No Comment look as she made herself comfortable amidst the luggage. She was used to my travel habits, which were a far cry from the spartan norms which my friend Satya was more accustomed to in his extreme adventures to the far corners of the world. Satya has climbed Everest four times, skied to the North and South Poles, climbed the highest peaks on all the seven continents, commanded submarines in the Indian Navy, is a TED Fellow and was now visiting with us for a couple of weeks. He girdles the globe seeking hard climbs in remote and dangerous locations (Afghanistan is a case in point), runs an Everest guiding service and delivers motivational talks around the world. I had planned a small hike for him which would be more like a walk in the park for a man of his abilities! 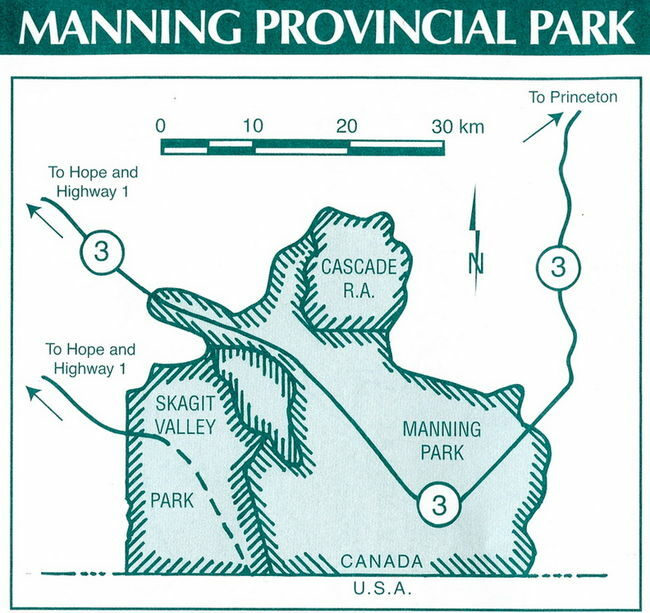 The park we were headed for was the E.C.Manning Provincial Park. The 230 km to the campground was covered quickly on a warm Saturday morning. Driving south along Highway 99 out of Richmond, then taking the Highway 10 exit gave Satya a rapid passing acquaintance with Delta, Surrey and Langley. Low clouds hid the imposing bulk of Mount Baker as we merged onto Highway 1 eastbound. I assured Satya that on a clear day Mount Baker provided a majestic backdrop on the drive to Abbotsford. I topped up my gas tank in Chilliwack because of the lower prices outside the Greater Vancouver Regional District, stopped at the Hunter Creek Rest Area so that Baby and we could stabilise our internal hydraulic pressures, each in their own manner! 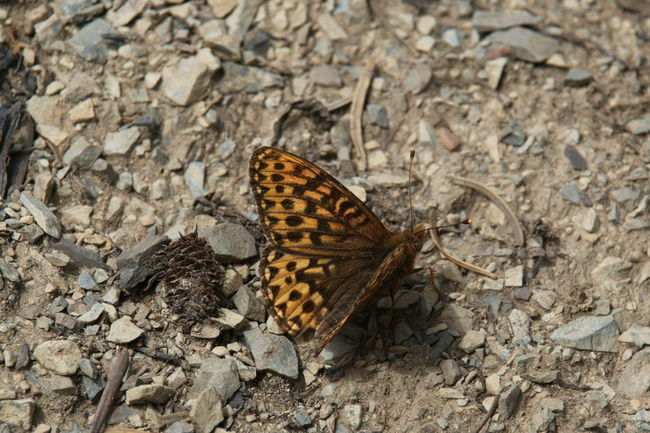 We trundled into the Coldspring campsite a couple of minutes before the 11 am deadline. I recharged my system with a quick brew of chai while Satya sampled an energy drink - his ascetic habits preclude foolish indulgences like good old fashioned dhaba style chai, one of my many weaknesses! A quick tour of the Canyon Loop Trail along the Similkameen river followed and then we headed out to the Lightning Lake Day Use area where Baby indulged in her favourite pastime - swimming and fetching sticks from the water. This was followed by a walk up to the first viewpoint on the Frosty Mountain trail where you can get a great glimpse of Strike and Lightning lakes and some of the peaks in the area. 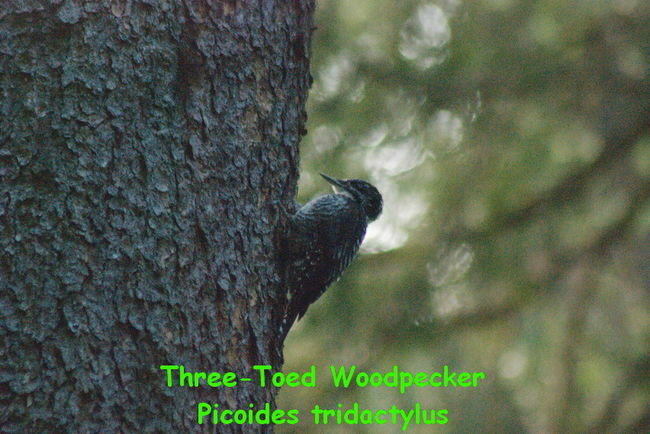 A bonus for me was sighting a three toed woodpecker in the dim light of the forest canopy on our way down. 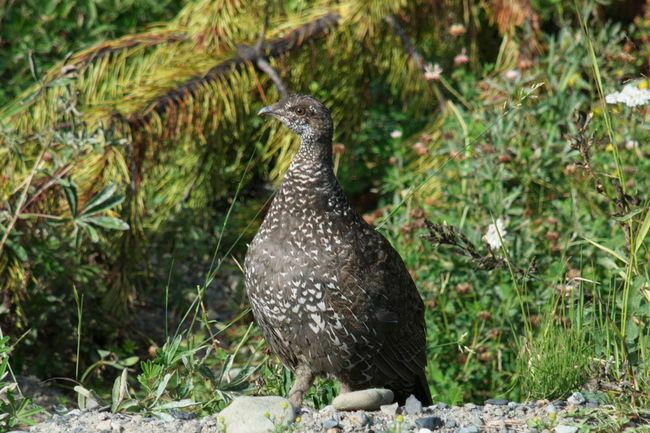 A grouse posed patiently for us by the roadside as we drove back to Coldspring. As we left the car at the Strawberry Flats parking lot the next day, a couple of Park Rangers were exiting the gate which blocked access to Gibson Pass. They asked us where we were headed and if we had registered ourselves for back country camping. I said we were going up to Poland Lake and yes, the back country permit was on the dashboard. The permit cost $5 per head per night and could be booked on line. They cautioned us about a couple of bears having been sighted in the area and suggested we keep Baby on a leash if we encountered the beasts. The 8 km hike to Poland Lake was pleasant enough, with a height gain of 435 metres and we had plenty of opportunities for taking photos along the way. Satya, fresh from climbing Everest for the fourth time in May and a jaunt in July up Europe&apos;s highest summit Mt.Elbrus, shouldered the heavier pack, whilst I cited my 10 year seniority in age as reason enough to carry the lighter one! 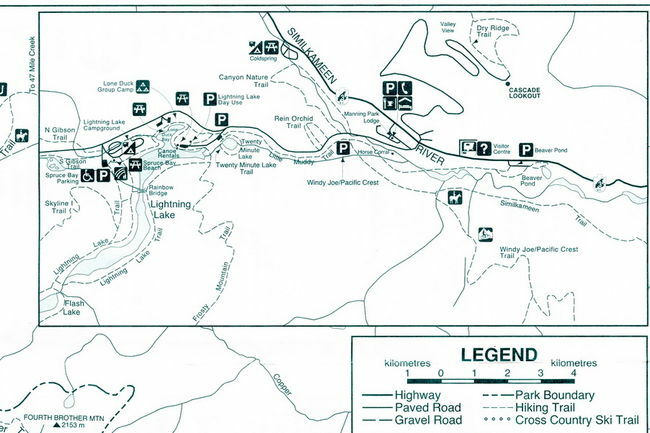 I had seen the Gibson Pass ski area posted up for sale and the bright red chairlifts hung like convicted criminals doomed for extinction as we passed under them and headed up a trail on the other side. The hills were very quiet, it being Sunday afternoon. The only other humans we met were a couple with two small children who were descending from Poland Lake and a solitary girl who was also coming down after a day trip. Satya was rather disappointed that we did not encounter any black bears! 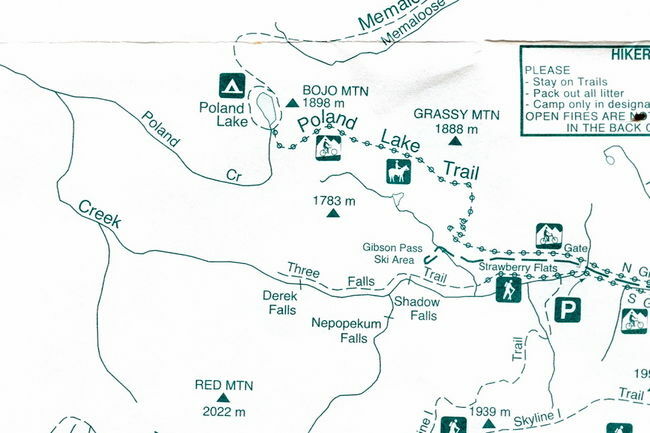 It was late afternoon when we reached the Poland Lake campsite and pitched our tents. We had the place all to ourselves. The sky became overcast very quickly and it became imperative that we heat up Baby&apos;s food first! My wife Margaret had cooked some tasty morsels of meat at home which was duly packed in the icebox we carried to Coldspring. Needless to add, Baby&apos;s meal smelt divine as it sizzled on the frying pan and I was tempted to sample a small portion; Satya would have followed suit as well if it hadn&apos;t been for the fact that he does not eat red meat! We had to settle for the Bombay Biryani and the Spicy Potato "Heat and Eat" pouches by Ashoka picked up from the Fruiticana outlet at No.5 Road in Richmond. By 7 pm we were in our tents, Baby and I sharing the orange Marmot shelter whilst Satya had the luxury of the blue Eurotrek tent all to himself. Very soon we heard raindrops on the tent fly and the pitter patter of the raindrops lasted all night. Baby snored peacefully beside me while Satya and I held a cross-tent conversation for a while before finally dozing off. 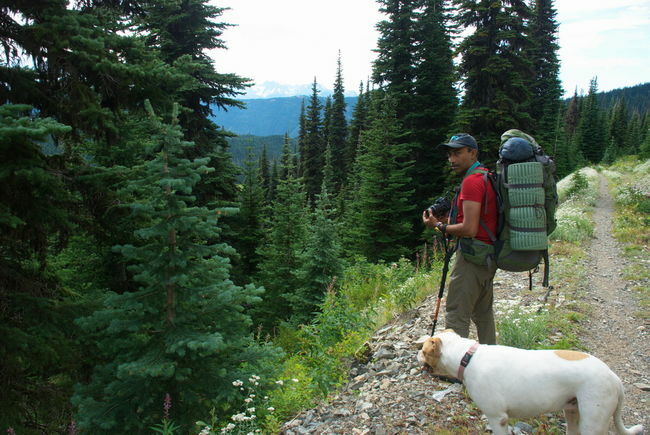 We descended the next day in good order, packed up the Coldspring campsite tent, and were soon headed up to the Cascades Viewpoint and Alpine Meadows on the north side of the highway to complete the Manning experience for Satya. The Cascades Lookout is a very popular viewpoint for tourists: an 8 km paved road leads up to this spectacular spot. 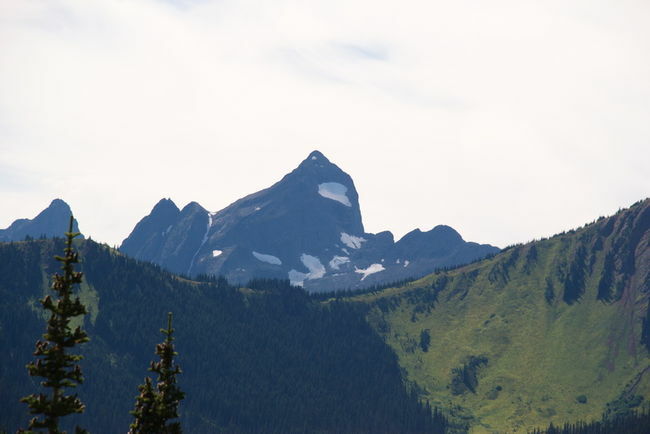 The views of Lightning Lake to the south east and the Cascades mountain range in the USA to the south and south east provide some stunning vistas. A Clark&apos;s Nutcracker and a couple of Golden Mantled Ground Squirrels boldly grabbed the handouts that the tourists put out for them and, for the first time in many visits to this place, I was fortunate enough to photograph a Steller&apos;s Jay, the "official" bird of British Columbia! This post was originally published on Thappyfeet. 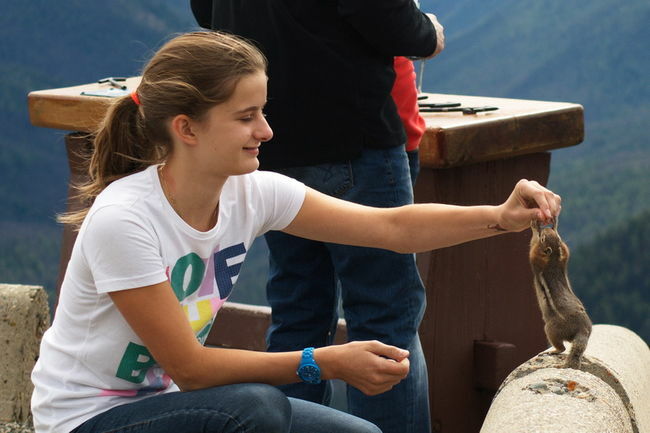 Must visit attractions in Washington DC.